Leading Manufacturer of automatic linear bottle washing machines for pharmaceutical industry from Thane. We are putting forth a broad collection of Linear Bottle Washing Machines for Pharmaceutical Industry, as we are manufacturer and supplier of the same. Our offered machines are fabricated utilizing premium quality crude material and most recent methods in agreeability with the global measures. The crude material utilized for the assembling of these items is reconnoitered different parameters with a specific end goal to guarantee their faultlessness. These machines have surprising gimmicks like erosion climate safety, vigorous development, dimensional exactness, and toughness. Customers can profit these machines from us in standard and in addition modified alternatives according to their shifted determinations. 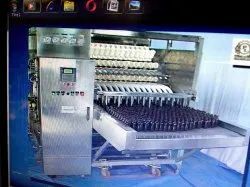 Looking for Linear Bottle Washing Machines for Pharmaceutical Industry ?